Here is an experiment with my webcam. The above image is a “live” image of my studio. When turned on, a new image will upload to the server in one minute intervals. Now, you have an opportunity to take a peek at my studio. You should be able to see different projects while they are being executed. This will also help keep me motivated about keeping my workspace tidy. I’ve been bad at keeping my blog updated lately. It’s not from a lack of anything interesting going on. Full time college took up a LOT more time than I thought it would. I have learned that it is impossible to do EVERYTHING well, my art career took a temporary hiatus while I adjususted to college life. My chemistry class was particularly time consuming, since it is not a subject that I have a natural talent for. And I will have a month between classes to get back to speed with my projects. Next semester, I am taking a lighter load. All classes are online, and relate to computers. I hope to merge my studies with my studio work, and develop a relationship between computers and my artwork. DSL is finally in my neighborhood! If you haven’t been to this blog for a while, please come back soon. I promise, I’ll have new posts for you to read! 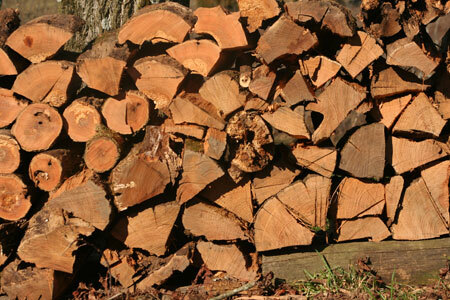 I’m heating with wood, and if anyone has a tree they need cut down and haul away, I will do it Free Of Charge! I have DSL now, but indoor plumbing is too modern for me! 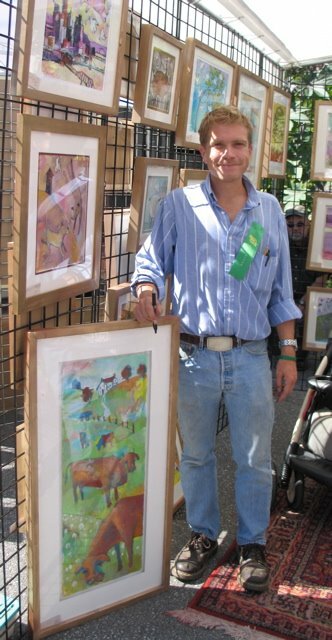 It was a perfect show in Hyde Park Square for their annual art show. The weather was pleasant, the crowd was friendly, and my artwork was well received. Thank you for the support of my good friends, old and new. For the last 3 years, I have participated in Fresh Art. A fundraising activity for the Behringer Crawford Museum in Covington, KY. It’s a great event where artists create a work of art in Devou park, where the musuem is located. At the end of the day, the artworks are exhibited in the musuem. The event concludes with dinner and an auction of the art for the musuem. I decided to try something different this year. Rather than paint in the traditional “plein air” tradition, I followed the footsteps of Chagall and Matisse, and let my imagination help paint the painting. While looking at Cincinnati’s skyline, I painted “porkopolis”. I am glad that I tried something different. The painting won an honorable mention in the exhibit, and it auctioned for $300. I will have prints of this painting available soon. Sorry, I’ve been a Bad BAD blogger. I woke at dawn, ate two bananas, and broke camp. I was seven miles from Rising Sun, IN. Entering the town, I passed a picturesque field of cows with a red barn. The morning seemed full of possibilities. 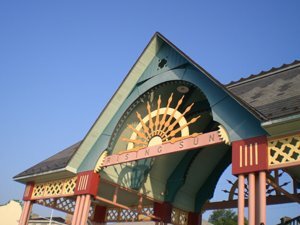 Rising Sun is building a reputation as an art colony on the Ohio River. It’s economy has been primed by the arrival of a casino boat, and the opening of the Pendelton Art Center. Now with a handful of galleries and studios, it is becoming a destination for the art enthusiast. 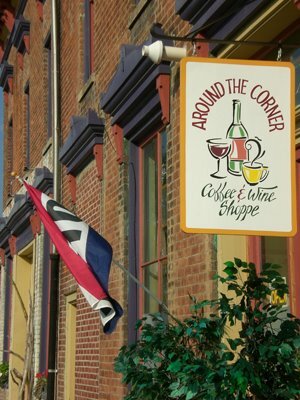 I had breakfast at Around The Corner-coffee and wine shop, where I met owner and artist, Lynn Englar. She offers wines from Indiana wineries and is part of the Indiana Wine Trail. Lynn is an artist in many mediums. While living in California, she was a mural painter. She is an experienced sculptor and photographer. At the present, her shop features her paintings…fantastic images with a theme of women and wine. The Pendleton Art Center was not scheduled to open until Wednesday. I told Lynn how much I regretted not being able to visit the center. The last time I visited Rising Sun, the center was not open either. Lynn gave a big smile, and opened a sliding glass door that connected her shop to the art center. She explained some of the artist’s backgrounds, and showed me Olinka Broadfoot’s exhibit in the main gallery. the emergency pump that I carry on my bike. an the trip back home. Madison’s bridge to Kentucky is not bicycle friendly. It is wide enough for cars only, so I had to stop traffic while i crossed the river. It was great to be back in Kentucky, and I was excited to get back home. I was hot, and my legs were feeling a bit sore. I made the mistake of passing grocery stores, thinking I would get a little more distance before stopping for dinner. Time passed, and i reached a point where I was starving, and there was no place to find food, or camp. The sun began to set, and I began to get frantic, then I entered a small town with a small grocery store complete with bananas, yoghurt, and gatorade. 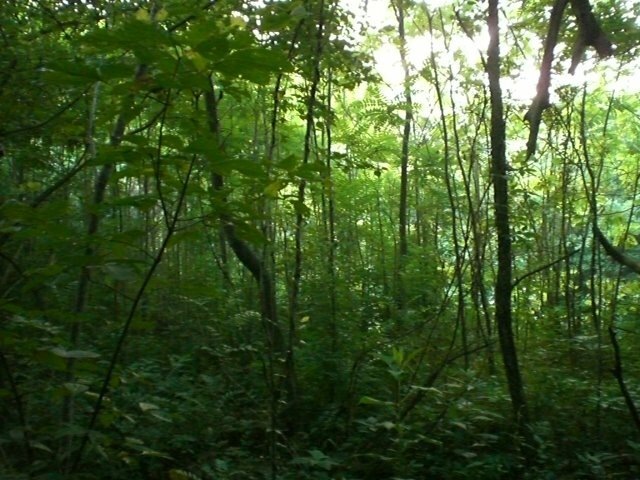 I gratefully bought my dinner, then crawled into the woods for the night. 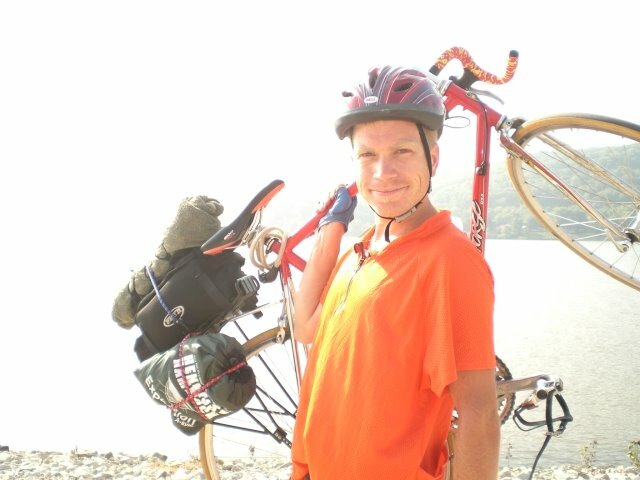 This week, I decided to take a cycling trip from Augusta,KY to Madison,IN. After having breakfast, I left Augusta very nervous. I had never cycled such a distance, and I had never camped alone in the woods. After traveling about 10 miles, I realized that I had forgotten my bicycle lock. Rather than spend unnecessary money further down the road, I turned around and passed the nasty barking houndog, climbed the giant 1 1/2 mile hill, and retrieved the bicycle lock. I reassured myself that the goal of the trip was to learn about bicycle touring…not to cover a set distance in a set time. About an hour after leaving Augusta for the second time, I was passed by a group of serious bikers. There were probably close to twenty in the group. All dressed in bright colored biker attire. They passed me with such a momentum, I felt like a child on a tricycle. The group was drafting off each other, and the only extra weight they carried was their water bottle, however, they triggered my competitive streak, and I began pushing myself harder…Hoping to keep up with their pace. After about 30 minutes hard cycling, I was relieved to see the last biker in the group take a different course. maintain a comfortable pace than try to achieve any speed goals. 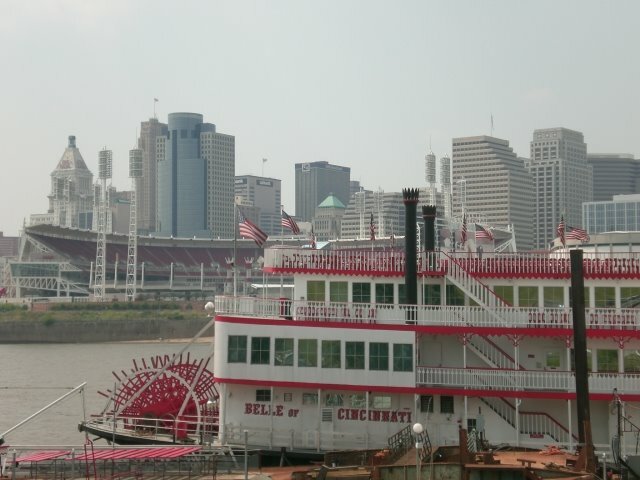 I began to enter Cincinnati metro area. Being Sunday, the traffic was not heavy. While approaching the cluster of bridges that connect Kentucky with Cincinnati, I was surprised at how quickly I covered such a distance. 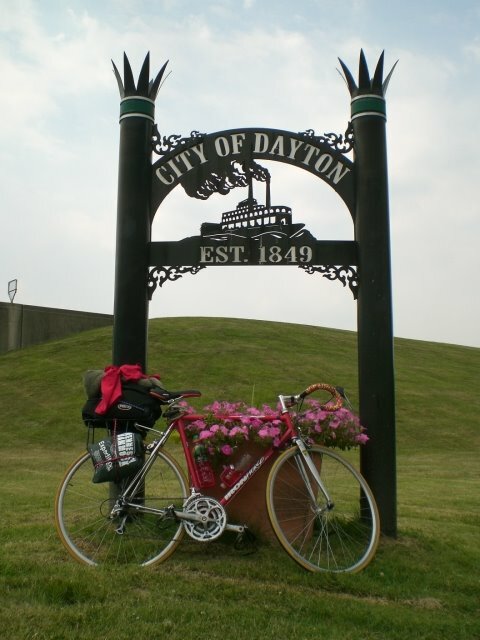 I now know that I can ride my bike into Cincinnati in about 3 hours. I kept my equipment very light with the mindset that most of what I need will be available while traveling. I made my first food stop at a Taco Bell, where I refueled with burritos and quesidillas. I followed the river along rt 8 out of the city until I reached the Anderson ferry. The ferry made me reminisce about our ferry in Augusta that crosses the Ohio…It seemed like a world away, even though I had only been on the road for a few hours. On the Ohio side, I traveled along hwy 50. It was not as bicycle friendly as Kentucky’s route 8. Although 50 was a four lane, it was much busier than kentucky’s river road. It also lacked the “share the road” signs that provided a sense of safety. I peddled west, passing a series of factories, until I reached a grocery store, where I bought 3 bananas and 3 cups of yogurt. 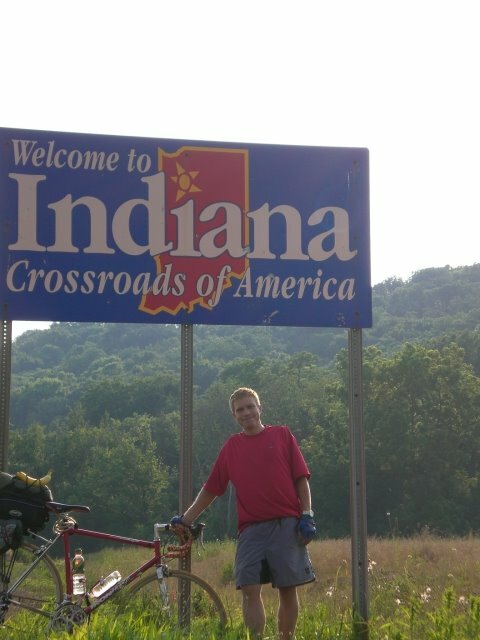 Later that day, I crossed the state line, entering Indiana. At that point, I decided that I wanted to stop a few miles before Rising Sun, IN. I followed the signs for the Ohio River’s scenic trail. It took me through old Lawenceburg, a town with some charming architecture, but dwarfed by a sprawling casino boat and factory industry. You would think that a city with so many revenue generating businesses would be able to afford to maintain their roads. Lawreneburg had the worst conditions for a bicycle…lots bumps, glass and potholes. After traveling through Aurora, IN, I began to look for places to sleep for the night. I had my eyes peeled for something wooded, away from from a private residence, and without a No Tresspassing post. After finding the spot, I carried my bike down a small hill and set up my Hennessey Hammock, a combination tent/hammock. It was hard to make myself comfortable, because it was a hot day, and a humid night. I fell asleep listening to one of my favorite podcasts, woken by the snort of a deer. The woods were pitch black, speckled with firefly lights. A dog barked at me, as i drifted in and out of sleep. May has been a record setting busy month for me. I finished the month by racing in Maysville’s Triathlon. It was my first triathlon. I’d never swam in open water before, so it was a challenge, but my time was good. I finished the race in less than 2 hours. I was one of 3 local participants, racing with our region’s more ‘experienced’ triathletes. My rank was in the middle of the pack. 33 out of 63. Inbetween races, I was busy preparing for Augusta’s “Art in the Garden”. One of my two scheduled outdoor art shows this year. It was a great show with good turnout, and the sales were excellent. I am returning ‘home’ to the DC area for a week. 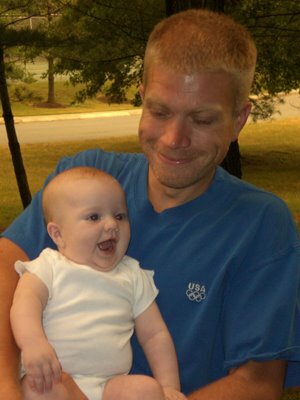 I will be meeting my little brother’s daughter “Mia” for the first time. I will also begin a new painting project. I am working on a series of scenes painted in Washington’s historic U street district for my gallery at HomeGrown Creations. I may have some sneek peeks as a reward for the patient friends who still check my blog from time to time. Then, I will slow down a bit and enjoy the artist’s life. I try to run, swim, bike or kayak every day. I am trying to incorporate the sports into my work. When possible, I carry a sketchpad and camera with me while biking/kayaking. I often think about paintings while swimming and running…especially while running through scenic landscapes. Please comment on this blog and share your stories and suggestions for combining leisure activities with your art (and work). I want to combine my love of outdoor sports with my art. I feel a little guilty spending so much time running, biking, etc. But, if I can incorporate my hobby with my WORK, I won’t feel like I am wasting my time so much…I’m WORKING! 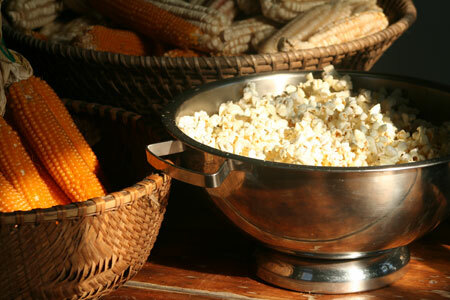 Yes, I realize that I am very fortunate to have WORK that I love and is fun…it just makes me feel DOUBLE guilty! 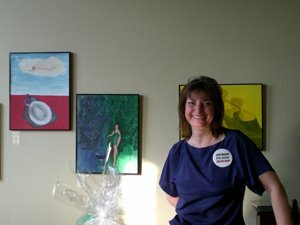 Last month, i took 3 paintings to a jury for the Hyde Park Art show in Cincinnati, Ohio. I chose paintings that were similar in theme which I considered to be strong work. 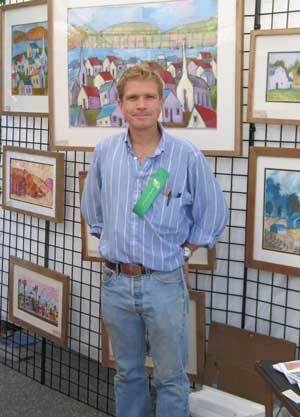 The judging was held in a community center in the neighborhood where the show was to be held. I wasn’t sure what to expect, but i was surpised to see over 100 artists waiting in line with a number. One judge was assigned for each category, painting, crafts, sculpture, photography, etc. The judge for painting was a young woman, possibly younger than me. While in line, I watched her body language while reviewing the other artist’s work. She was animated, and having some intense dialogue with the artists. I noticed that when an artist brought work that I considered to be exceptionally well done, the judge would pick up her clipboard and make notes after the artist leaves. She did not do this after reviewing what I considered to be a weak body of work. The Hyde Park Show is a very prestigious show in Cincinnati. It has a reputation for excellence, so all the best collectors and dealers attend and purchase. This makes the show very desirable for any artist in the region. Getting into this show is very important for my plan as an artist. I was at wits end when my number was finally called for judging. While my work was being reviewed, I had no idea what kind of questions the judge would ask. Ideally, she would comment on how good the work was, and tell me that she definately wanted me in the show. That didn’t exactly happen. Instead, she started critiquing my work. 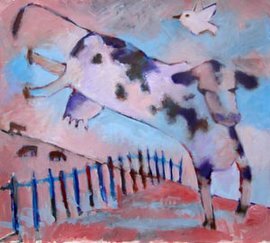 She suggested that I show how my paintings of farm animals interact with my life. She also warned that I might be at risk of producing gimmicky work. Finally, she added that she did not think that contemporary artists should sign the front of their work. It takes away from the art. You should sign either the matting or the back of the work. I left the building with a sinking feeling in my gut. The judge did say nice things about my work also, but the negative things just stuck in my mind. It looked like in the corner of my eye, I saw her pick up her pen and clipboard…but maybe it was just to scratch her nose. I know that juries are very subjective, and not to take these things personal. It took a while to shake it of, after talking with a few friends who are successful artists. Experiences like this are common in the business. It was reassuring to hear that I am not the only one going through this process. It turns out she was writing my name on the clipboard after all! I just received my letter of acceptance into the Hyde Park Art Show. Of course, you are all invited to attend. It will be October 1st, 2006 in Hyde Park Square. I would be interested to hear what you think about this story. I know that everyone goes through this…especially artists who put a very personal type of work on display. I sure hope it gets easier…but it hasn’t yet! 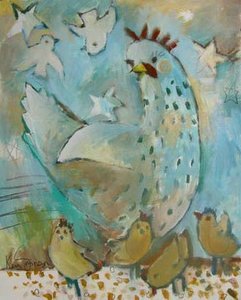 It is my pleasure to announce that my painting “Hen and Chicks” has been juried into the “Bluegrass biennial 2006” at the Claypool-Young Art Gallery at Morehead State Uniersity. This showcase of Kentucky’s best artists is held every other summer. I am shocked and proud that my work has been accepted into this show. I am pleased with the warm response given to my new body of work. If in the Morehead area, stop by to see the exhibit of Kentucky’s finest artists. It is from June 3rd-July 28 2006. The opening reception will be on Saturday, June 3rd 3:00-5:00. There will be refreshments and live music by Brett Ratcliff, an Eastern Kentucky old time acoustic musician.